In real life, it can be in fact easier to think in terms of survival function instead of probability mass function. For example, say you want to decide, should you purchase the monthly membership of a Gym. Say, you do not like to go to Gym, but in order to reduce weight, you are kind of forced to start physical exercises. Chances are that, even if you buy a monthly membership, you may not utilize the full benefit by going to the gym regularly. If you would go to the gym very infrequently, paying daily is cheaper than paying a monthly membership. Eliciting the probability of your gym attendance can be a good idea to take a decision. How can you elicit the probability of your gym attendance? Now, ask yourself again, Will I go to the gym at least 2 times? Answer: Hmm, yes, I think so, but, I cannot say with 100% confidence. Rather, I can say in 99% confidence. Ask yourself again, Will I go to the gym at least 4 times? Then, again, ask yourself, 'Will I get to the gym at least for 15 times? Answer: maybe, with 10% confidence. Finally, will I go to the gym? at least 25 times? Answer: You know that, definitely, you are not going to do that. So, SF(X = 25) = 0. 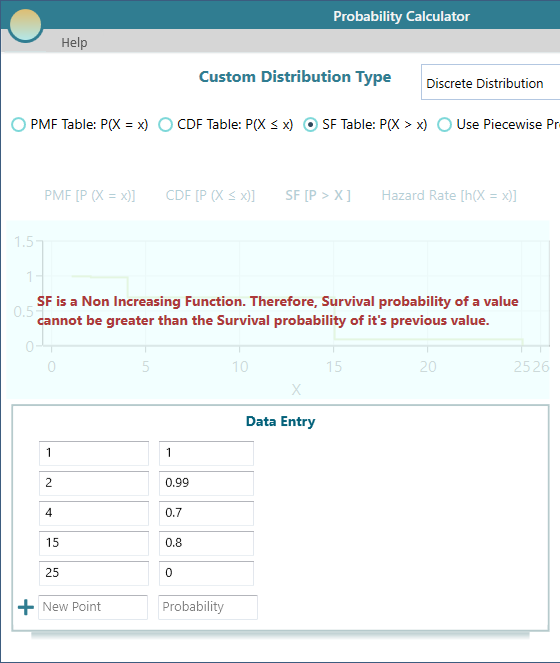 Notice that, once you entered the data, a Survival function plot is displayed. 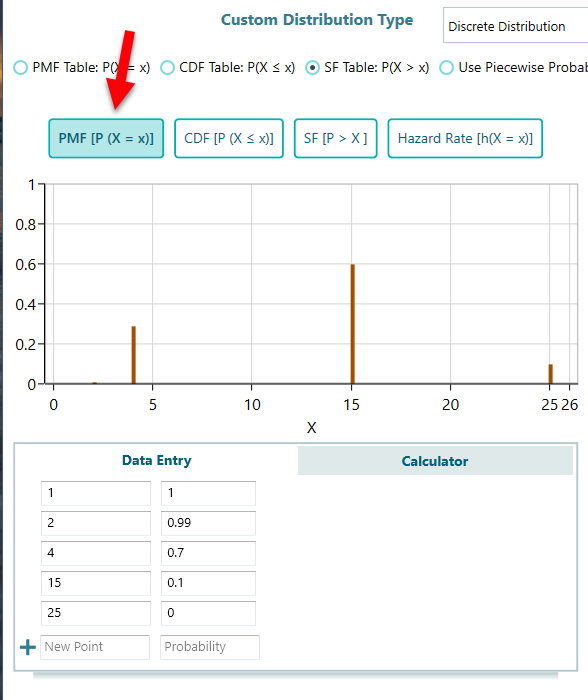 You know that you can view PMF, CDF, SF, Hazard rate anytime. 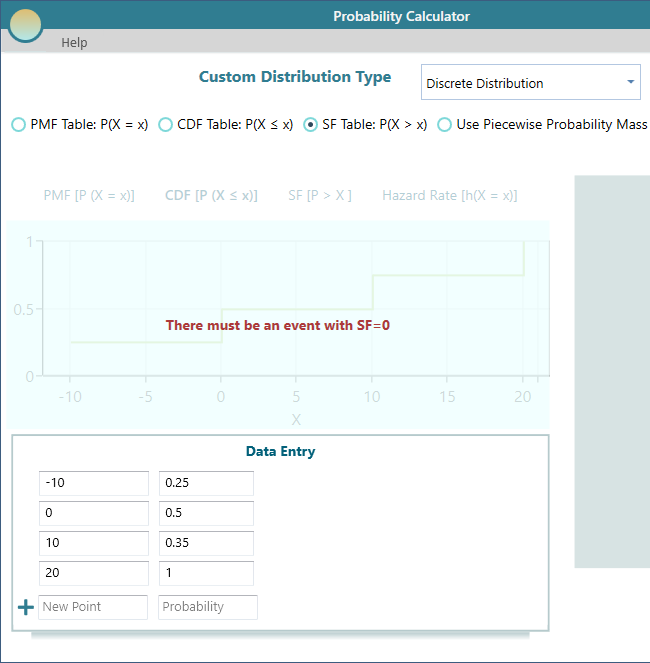 So, once you entered your SF table, click the PMF button to see your Probability Mass Function, which is automatically calculated for you. Ok, now you see your Probability Mass Function (PMF). Your PMF shows that going to Gym for 15 times has the highest probability. So, you got the idea about how likely you will go to the Gym. Now, you can calculate the daily fee for 15 days and weight against the monthly membership fee. If the price for 15 days (paid daily) is still expensive than monthly membership, then buy the monthly membership. Otherwise, pay daily. Survival function must have a definition of a Random Variable whose SF value will be 0. If you miss that entry, you will see an error message like this: "There must be an event with SF=0". Survival Function is a Nonincreasing function. Let's think about the Gym example again. Say, you are saying that you have more confidence that you will go to the gym at least 2 times in a month. But you have less confidence that you will go to the gym at least once a month. Does it make sense? No, right? For a given interval, say a and b, are 2 variables. if a function is f(x), and if a > b, then it must be true that, f(a) ≤ f(b). 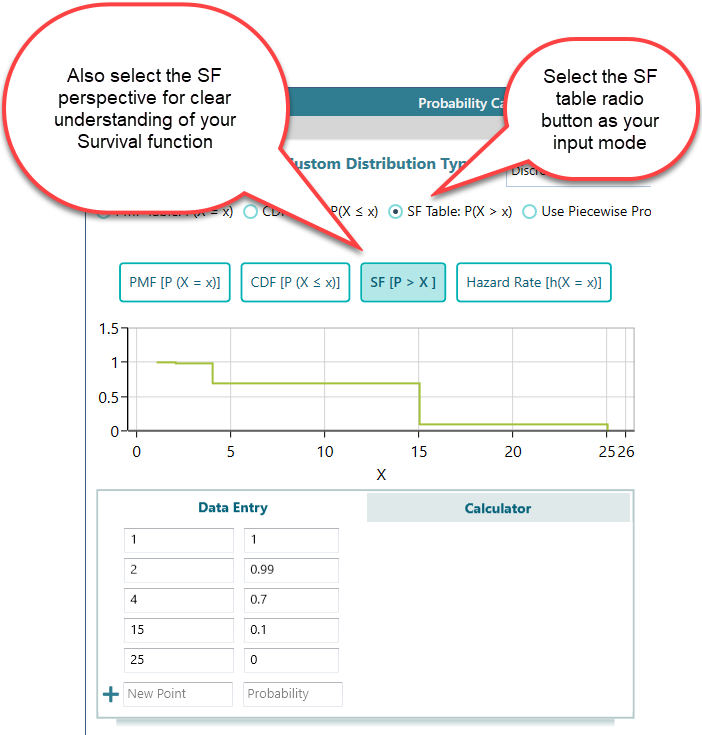 As a survival function is a nonincreasing function, an entry in the SF table cannot have SF value greater than the SF value of the previous row. If you do not follow this rule, you will get an error message like this: "SF is a Non-Increasing Function. Therefore, Survival probability of a value cannot be greater than the Survival probability of its previous value."